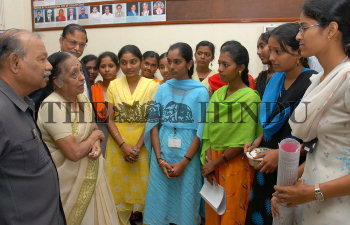 Caption : CHENNAI : Dr. V. Shanta, Chairman, Adyar Cancer Institute, Chennai Interaction with Students at the National Science Day Celebration function in Presidency College on February 28, 2007. Also (seen from left) Prof. Dr. J.G. Kannappan, Former Principal, Govt, Dental Hospital and Prof. Dr. S. Ramanathan, Principal, Presidency College. Photo : M. Vedhan.